Our gourds are a special selection of the oddest shapes and colors to please and attract everyone. Gourds are rapid growing climbers that can be grown on a trellis or allowed to run in the garden. May also be planted among the corn. Cut from vines with Pruning shears leaving 3 inches of stem. Allow fruits to remain on vine until fully mature. Gather gourds before frost. Wax or shellac mature fruits for year round ornamentals and table decorations. 560 Seeds/oz. Plant 1/2oz per 100ft row. 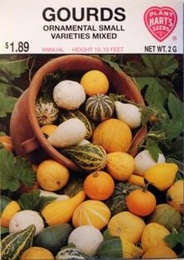 2lbs of Gourd seed needed per acre.